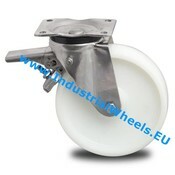 We sell stainless steel castors with nylon (polyamide) wheels for when unusual situations arise, such as a corrosive environment or when sanitary considerations demand them. 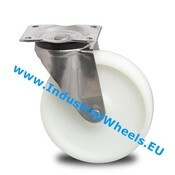 The wheels are equipped with a plain bearing. 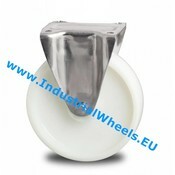 The polyamide wheels have a low rolling resistance and handle well on smooth surfaces. They are shock and impact resistant as well as corrosion resistant. With a stainless steel swivel castor, polypropylene wheel & rubber tread these wheels are perfect for humid or wet industrial environments. They are mostly used in the food processing and pharmaceutical industries under carts and trolleys. They hold up to 450 kg per wheel.